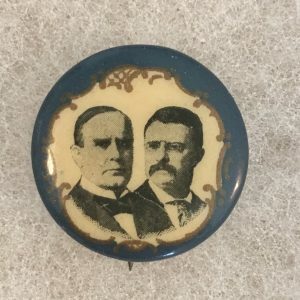 Theodore Roosevelt Campaign Buttons compliment any collection. 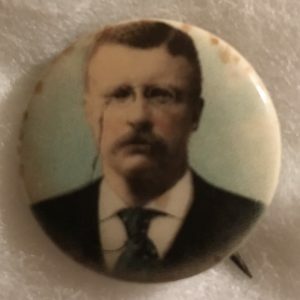 Theodore Roosevelt (October 27, 1858 to January 6, 1919) was the 26th President of the United States (1901 to 1909). He is noted for his exuberant personality, range of interests and achievements, and his leadership of the Progressive Movement, as well as his cowboy persona and robust masculinity. He was a leader of the Republican Party and founder of the first incarnation of the short lived Progressive (Bull Moose) Party of 1912. Before becoming President, he held offices at the city, state, and federal levels. 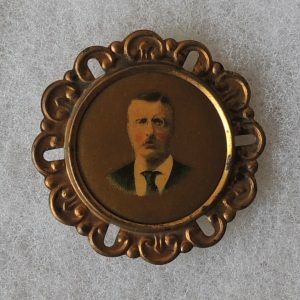 Roosevelt’s achievements as a naturalist, explorer, hunter, author, and soldier are as much a part of his fame as any office he held as a politician. 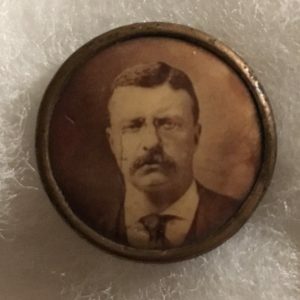 Roosevelt was 42 years old when sworn in as President of the United States in 1901, making him the youngest president ever; he beat out the youngest elected president, John Fitzgerald Kennedy, by only one year. 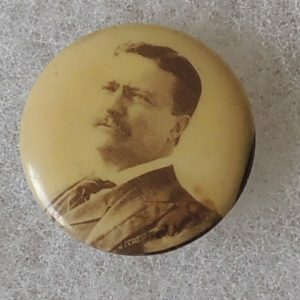 Roosevelt was also the first of only three sitting presidents to have won the Nobel Peace Prize. The Teddy bear is named for him, despite his contempt for being called “Teddy”. 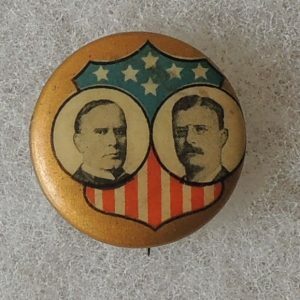 As lacking in imagery, themes, and slogans as Alton B. Parkers campaign, Theodore Roosevelt (TR)s 1904 campaign was full of all three. 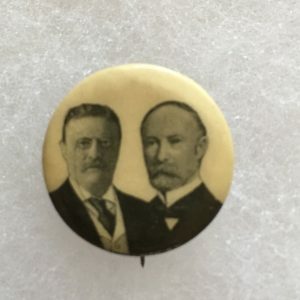 These included his famous toothy smile, mustache, pince-nez eyeglasses, TR in his Rough Rider uniform, and of course, the famous teddy bear. 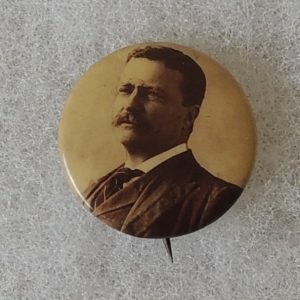 TRs primary theme for the 1904 campaign was his pledge to provide a Square Deal to all, which meant conservation of natural resources, control of corporations, and consumer protection. One of the other most notable slogans of TRs campaign was Stand Pat which meant do not change course away from sound money, protection, prosperity, and expansion. 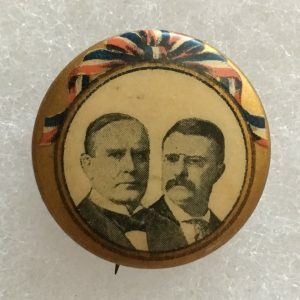 In 1912, Roosevelt bolted the Republican Party when, in his view, President William H. Taft stole the nomination away from him and created a new political party, The Progressive Party. 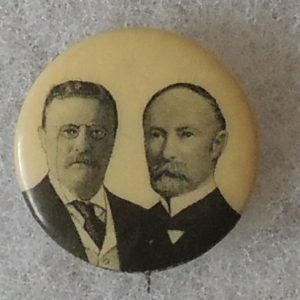 When Roosevelt decided to run, he made two particularly famous statements, My hat is in the ring, and I feel as strong as a bull moose. 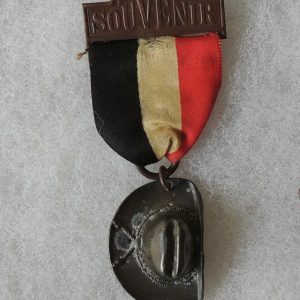 As a result, there are several different buttons featuring the my hat is in the ring slogan. 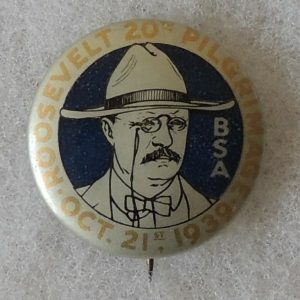 In response to the second statement, TRs Progressive Party was nicknamed The Bullmoose Party and the Progressives officially used the bull moose as their mascot resulting in dozens of buttons and other items with the bull moose on them.